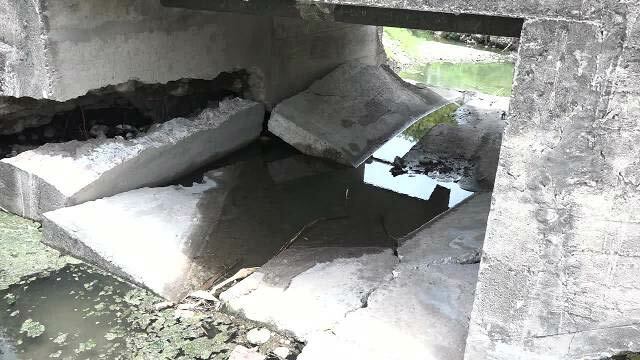 Last week’s heavy rain fall caused the collapse and temporary closure of a bridge that leads to Bath Village, said Director of Public Works Raoul Pemberton, though the department has been aware of “ongoing issues” with the bridge. Drivers must use an alternate route of the Bath Ghaut bridge, which is in close proximity to the Bath Village New Testament charge. The road is currently closed to incoming and outgoing traffic. Pemberton explained that excessive erosion to the foundation of the bridge caused the collapse. Pemberton, however, did not elaborate on the exact cause of the ongoing issues, but said that “due to [the damage], the middle section was somewhat suspended and traffic during a period of just a day caused the collapse of the middle section.” He also noted the south side experienced total erosion of half of the support. The Honorable Troy Liburd, junior minister of Public Works, visited the Bath Village site Monday after he received reports the area was secured and safe to enter. He reported surveys have begun for repairs to the collapsed bridge. “We working on remedy in the shortest space of time,” he said. The timeline for repairs has not been determined.